Kenneth Anger, Beverly Drive north of Pico Boulevard, Los Angeles, February-March 2010. Part of "How Many Billboards? Art in Stead" temporary project organized by the MAK Center for Art and Architecture. "Anger's ambivalent relationship to the spectacle of Hollywood, visible in his films as well as in his famous book Hollywood Babylon (Paris, 1959), is here directed towards the media. 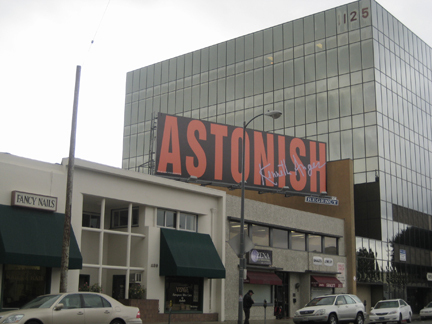 "ASTONISH" can function as recognition of the media's ability to astonish, as a critique of its power over the public, or perhaps, as a call for the media to step up its game and actually create something that can truly astonish. The multiple potential referents for the bold neon statement are raised to the power of two when cross-referenced with Anger's signature." - text from a longer description by Nizan Shaked, http://www.howmanybillboards.org/, accessed 03/2010.